Extreme Reach has released its Q4 and full year 2018 Video Advertising Benchmarks report, which further reinforces the ascendance of connected TV (CTV) viewing and monetization. 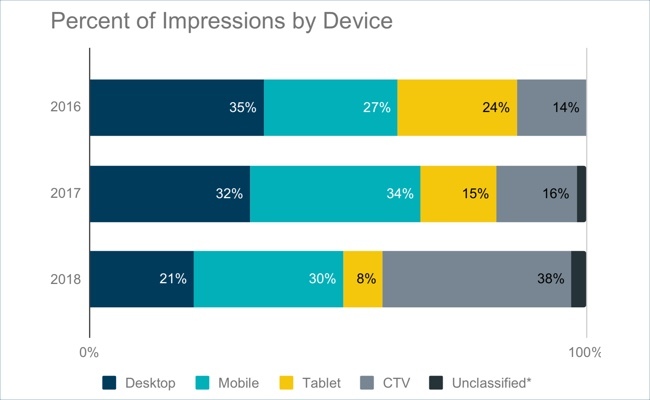 Importantly, the ER research is the first I’ve seen that highlights how CTVs are actually helping 30-second ads gain share of impressions vs. ads of other durations. This is a critical development as it helps re-energize TV advertising’s traditional workhorse unit that has been under pressure from all corners. CTV viewership is continuing to muscle in on other ways of watching video. According to ER, mobile’s share fell from 34% in ’17 to 30% in ’18, tablet from 15% to 8% and desktop from 32% to 21%. And video completion rates for CTV in ’18 were highest at 95%, compared with 83% for tablet and 75% for both mobile and desktop. The growth data for CTV is roughly in line with other industry research, but the real eye-opener from ER is data showing that CTV growth is re-energizing 30-second ads. 30-second ads grew from 32% of impressions in ’17 to 54% of impressions in ’18, which ER ascribes to the growth of CTV, which I believe makes sense. Like CTVs themselves, 30-seconds are taking share from other durations, with 15-seconds dropping from 62% share in ’17 to 42% in ’18. Much-heralded 6-second ads saw their already tiny share become even tinier in ’18. The CTV growth and ad duration data are very positive news for content providers and advertisers. For content providers, the data implies upside potential in unit monetization for individual shows - longer, more expensive 30-second spots that can be better targeted with richer data sets. Ultimately this could help support shorter ad pods, leading to improved viewer experiences which are desperately needed in the ad-free age Netflix has spawned. Similarly, for advertisers, CTV offers improved targeting and ROI on their spend (see my Amazon post from yesterday for more on this) and the reinvigoration of the 30-second format means a return to a format that helps tell brands’ stories without being rushed into a 15- or 6-second slot. For all of these reasons and more, CTV growth remains one of the most important themes in the industry. There’s a lot of other great data in the report as well, which can be accessed here. And note, CTVs will be in focus at the 9th annual VideoNuze Video Advertising Summit on May 29th, of which Extreme Reach is a Premier partner - register now to save and double your chances of winning a 55-inch Roku TV!